One of the most fun parts of the holidays are all the cute, yummy treats that go along with it. These chocolate kiss cookies are super easy to make and are perfect to take to a party or to gift to a neighbor or friend. The holidays will be here before you know it, so make sure to save this recipe! 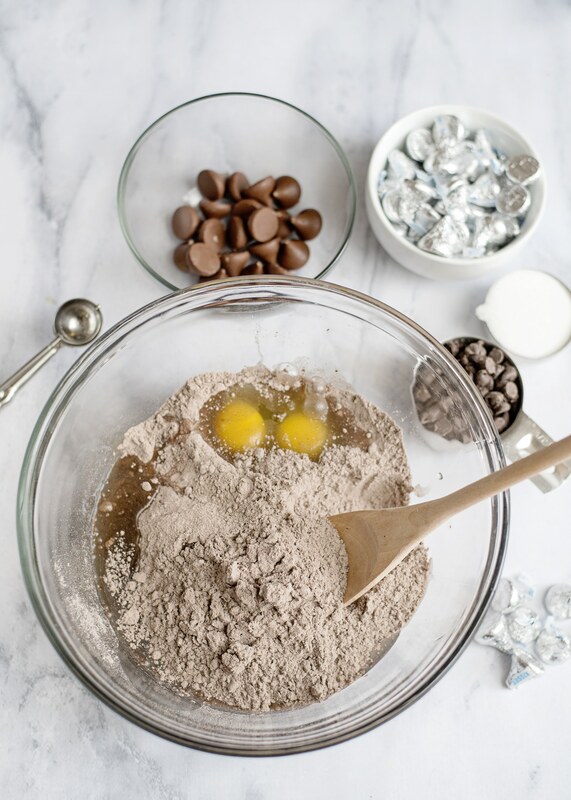 To begin making the chocolate kiss cookies, preheat the oven to 350 degrees. It is especially important to preheat the oven when baking cookies and other baked goods. Putting baked goods in a cold oven can affect the texture and the rising process. 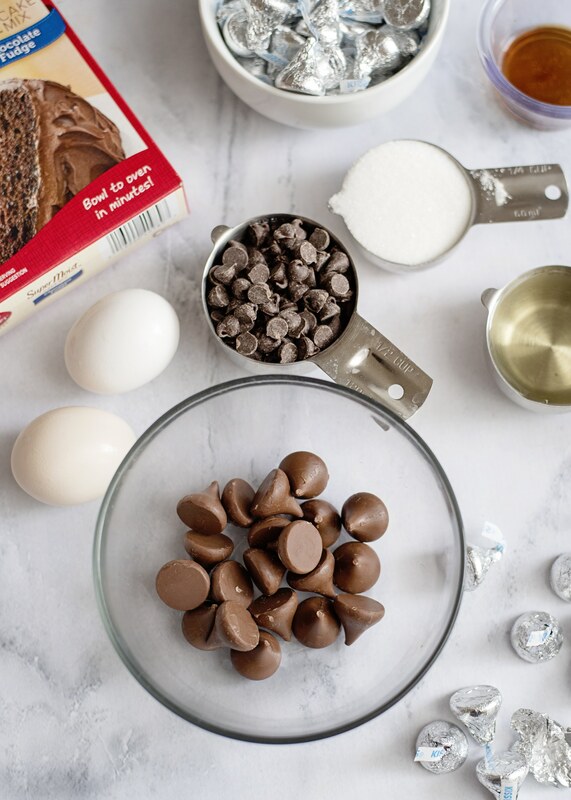 Now it is time to gather the ingredients for the chocolate kiss cookies. 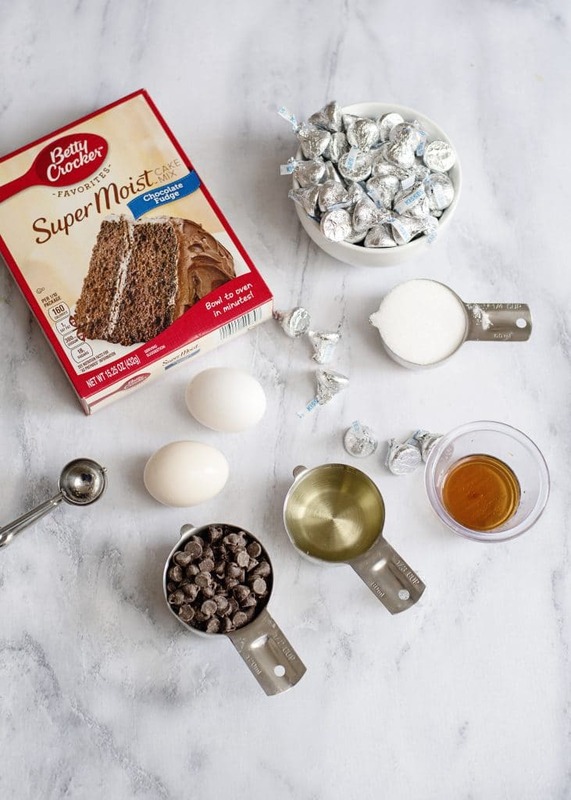 You will need a box of chocolate fudge cake mix, vegetable oil, eggs, vanilla extract, semi-sweet chocolate chips, granulated sugar, and Hershey kisses. Start by unwrapping the Hershey kisses. This will save time later. Set them aside for after the cookies are finished baking. In a large bowl, combine the cake mix, oil, eggs, and vanilla. Mix until a soft dough is formed (be sure not to over-mix). 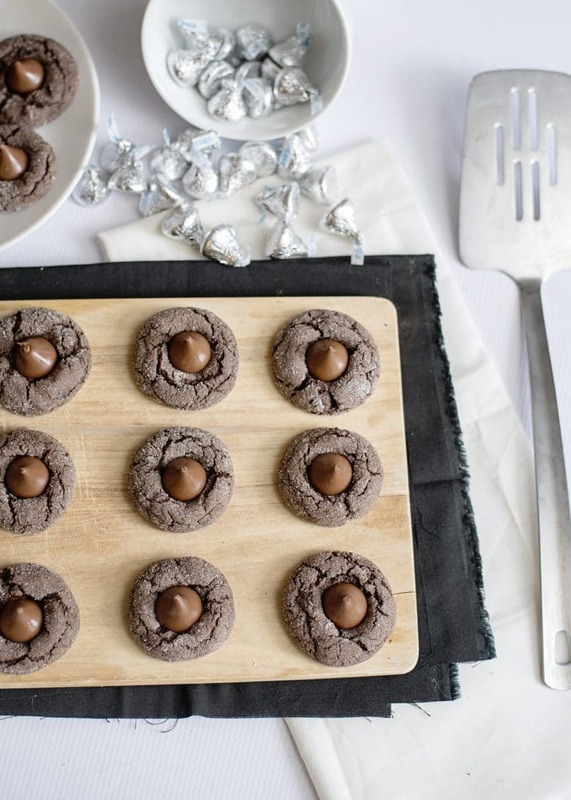 What makes these chocolate kiss cookies even better is the addition of chocolate chips! Can you ever have enough chocolate? Stir in the chocolate chips until just combined. 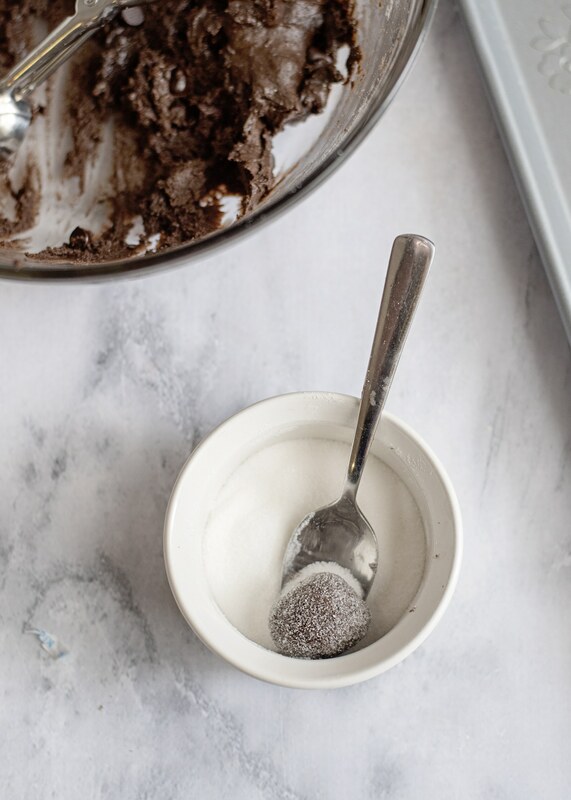 Using a teaspoon or a small cookie scoop, scoop the cookie dough and roll it into a ball. This Pampered Chef scoop is so handy for scooping cookies, cupcake batter, and even meatballs! Then, roll each ball into granulated sugar and place 2 inches apart on the cookie sheet. Parchment paper or a silicone mat work great for easy clean up and to prevent the bottoms of the cookies from burning. 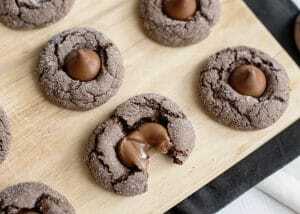 Bake the chocolate kiss cookies for 9-10 minutes. 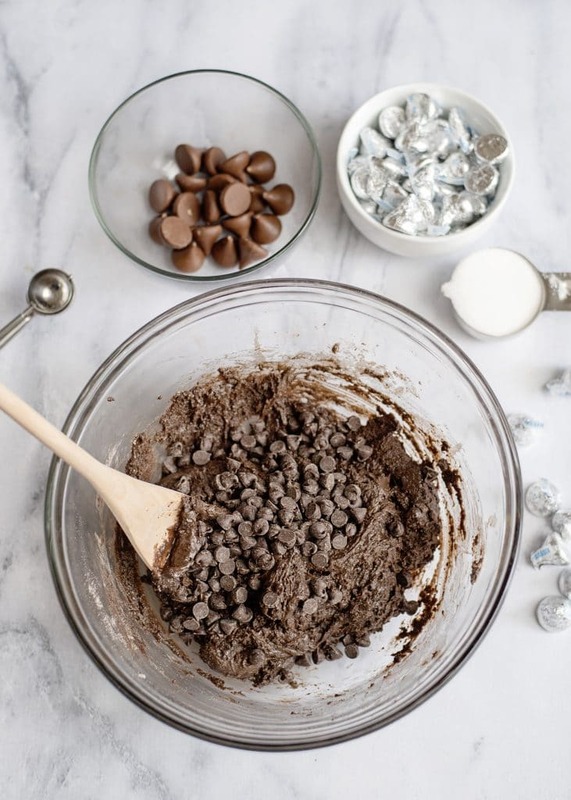 When the cookies are finished, immediately press a Hershey kiss into the middle of each cookie (you will be glad you unwrapped them all first!). Once the cookies have cooled for a few minutes, transfer them to a cooling rack. Don’t those look yummy?! 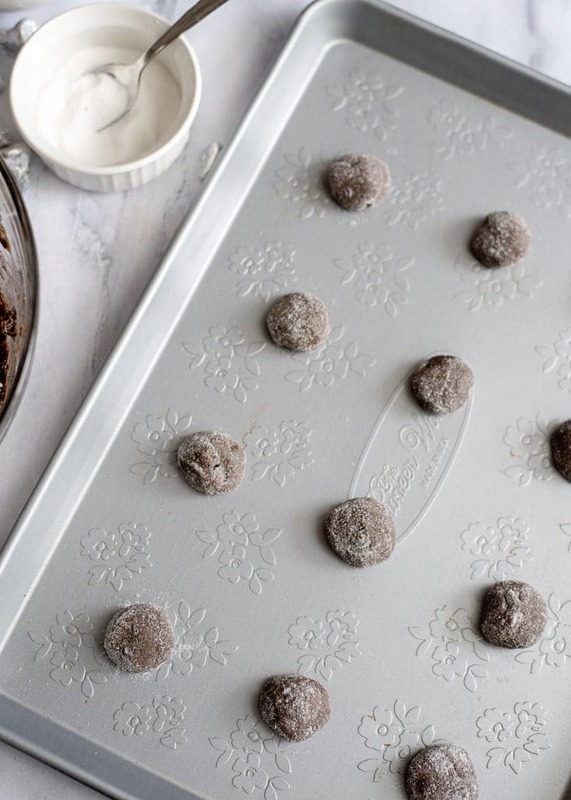 It’s never too early to start baking Christmas cookies, right? 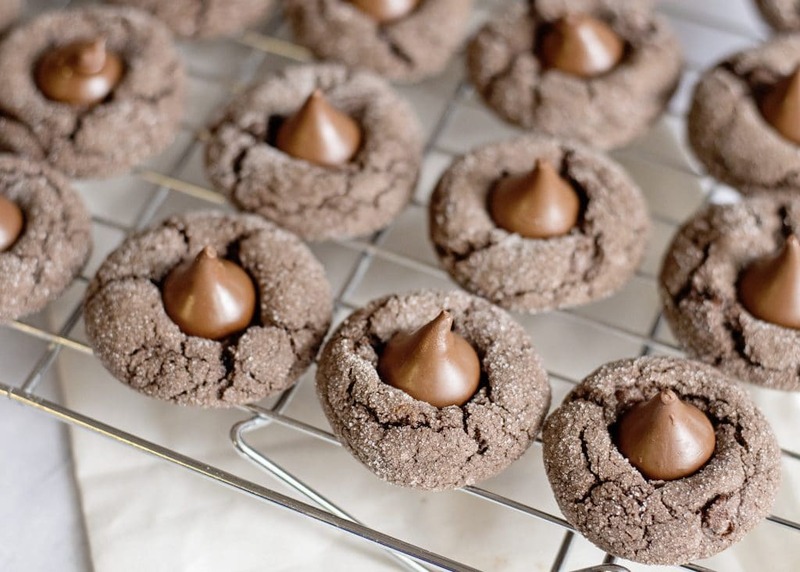 Be sure to print this chocolate kiss cookie recipe below! Start by unwrapping the Hershey kisses and set aside. In a large bowl, combine the cake mix, oil, eggs and vanilla and mix with a spoon until soft dough is formed. Stir in the chocolate chips just until combined. Using a teaspoon or a small cookie scoop, scoop the cookie dough and roll it into a ball, roll the ball in the granulated sugar and place 2 inches apart on a non-stick cookie sheet. Bake for 9-10 minutes. When done, pull the cookie sheet out of the oven and immediately press a Hershey kiss into the middle of it. Let the cookies sit for a minute and then transfer to a cooling rack. The Hershey kisses will remain very soft for a good 20-30 minutes. Weight Watchers FreeStyle Points : 6 points each with 28 cookies.